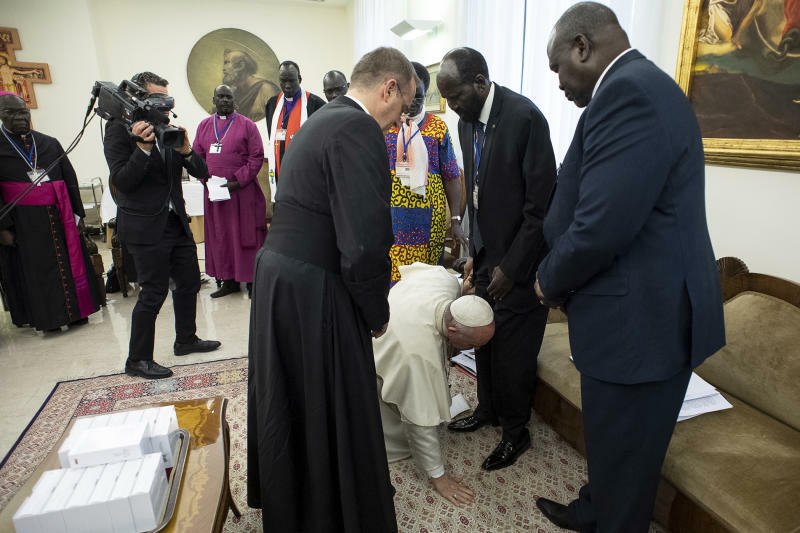 Hosting the leaders, the Pope called for peace and reconciliation in the country, and that he wishes to visit South Sudan. Those attending the meeting included South Sudan's President Salva Kiir, vice president and former rebel leader Riek Machar, and three other vice presidents. I am asking you with my heart, let us go forward. There will be many problems but they will not overcome us. Pope Francis told them how he learned last September that a peace agreement for the country had been signed and congratulated political leaders for "having chosen the path of dialogue". Several ceasefire agreements and peace pacts have failed to end the fighting, which has led to the death of an estimated 380,000 people, uprooted a third of the population, forced almost two-and-a-half million into exile, and triggered bouts of deadly starvation. "But in front of the people, hold hands united". The arch-rivals last saw each other in October previous year, shortly after the signing of a power-sharing deal, when Machar made a brief return to Juba for the first time since fleeing on foot in a hail of gunfire in July 2016. This is a completely unrealistic vision, but that never stopped the Popes from trying, and Pope Francis perhaps the more than most. "The goal of this retreat is for us to stand together before God and to discern his will; it is to reflect on our own lives and the common mission God has entrusted to us; to recognise our enormous shared responsibility for the present and future of the people of South Sudan and commit ourselves to be reinvigorated and reconciled to the building up of your nation". "People are wearied, exhausted by past conflicts: remember that with war, all is lost!" Following the military takeover in Sudan, concerns are being heard that the fragile peace might be in peril. "We Christians believe and know that peace is possible, for Christ is risen". The idea to hold the retreat from the 10-11 of April was proposed by the Archbishop of Canterbury, Justin Welby who also is taking part in the retreat together with the ecclesiastical authorities of South Sudan.